EC Drawing Ink is a water-based transparent ink, blended with shellac for quick drying. It is waterproof when dry and has a low resistance to light. 16 Brilliant colours available in 30ml and 500ml, with black ink available in 2L. 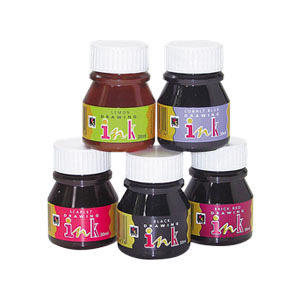 EC Drawing Ink is suitable for paper, card and most porous surfaces. Apply EC Drawing Ink with a brush or nibs, great for calligraphy, artworks and craft projects. Due to its quick drying, it is not recommended for airbrushing.